The City of Kettering Volunteer program strives to provide volunteers with a positive experience that will promote creativity, expand knowledge, and utilize skills and talents. 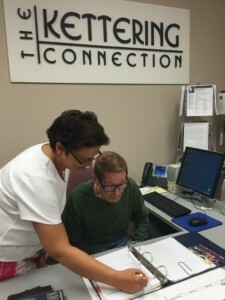 Volunteers answer phones and greet guests at The Kettering Connection, a service for seniors. Summer Camp volunteers are needed to help with various camps at Rosewood Arts Centre and Habitat Environmental Center. Camps run June-August and volunteers will be working with children. 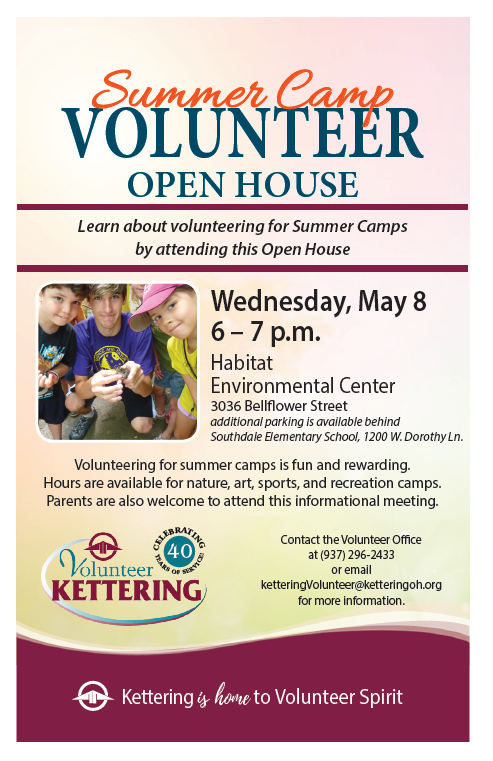 We will be having a Summer Camp Volunteer Open House on Wednesday, May 8th from 6 P.M. until 7 P.M.at the Habitat Environmental Center. Fraze ushers are needed to greet patrons who are coming to enjoy an event. This position is available June through September in accordance with the Fraze Pavilion schedule. Ushers are asked to work eight shows throughout the season which work with their availability. For some shows, ushers could receive a ticket to stay and enjoy the evening as a patron. Drivers are needed for our senior transportation and courier programs. This position requires one morning or afternoon a week. Must have a valid Ohio driver’s license. A background check with fingerprinting will be conducted. Senior Transportation Schedulers are needed at the Lathrem Senior Center from 8 a.m. – noon on various weekdays. Volunteers need to have a pleasant phone voice and be somewhat familiar with computers. Special Event volunteers are needed throughout the year to assist our Parks, Recreation & Cultural Arts Dept. with family activities. These events take place in the evening or during the weekend. These are excellent opportunities for students and working folks to give back to our community! Receptionists are needed to answer phones and greet visitors in various offices throughout the city. These volunteers are on an on-call basis. Contact the Volunteer Office at 296-2433 for additional information on these opportunities. If you don’t see an opportunity that interests you, you may still complete a volunteer application. Just specify your interests and we will contact you when an opportunity is available. 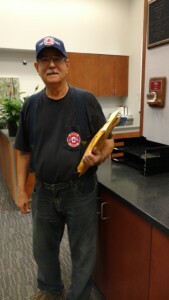 Kettering’s fire department relies on its volunteer fire couriers. Volunteers need to be at least 14 years of age. We sometimes allow younger youth groups to assist with special projects providing an adult accompanies the group. Our volunteers include those with professional and technical work experience as well as people who don’t live in Kettering. Volunteers 18 years of age and older will be subject to a background check.